Do you work at Rack and Tenter? What did you think of Rack and Tenter? There is a bit of a sterile feeling at The Rock & Tenter. The decor is a bit stark and it is lacking in atmosphere. In the evening it can get quite busy but they need to dim the lights. The Rock & Tenter has got all the standard drinks available and a couple of ales. The Rack and Tenter is fantastic pub and is very spacious. It offers everything from quiet corners to vast standing and seating areas and they have a cool outdoor area for dining in the warmer weather. 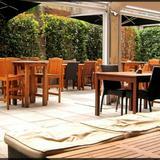 The Rack and Tenter also has friendly staff and is a great boozer. 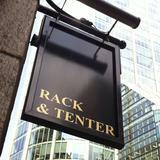 I'm not sure what pub you're talking about as " The Rock & Tenter" is not the Rack and Tenter. This place has been refurbished and has the best bar maids in the city. 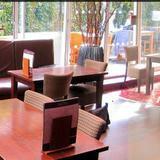 It is a great atmosphere and cheap drinks as cheap as any Wetherspoons without the tacky feel. This Moorgate bar is unremarkable but friendly, capably accommodating large groups of City workers in a relaxing environment. 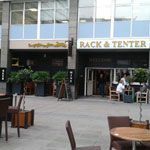 Rack & Tenter is located near Moorgate tube station, on a busy City square off Moorfields. The vast outside seating area, cordoned off in the shadow of towering glass-fronted buildings, is in the midst of some serious Square Mile real estate and the outer façade of the pub reflects this, with imposing pillars and spotless double glazing. Inside, the layout is equally shiny but slightly more haphazard, with high tables and booths scattered beneath a low ceiling and some rather mystifying modern sculpture placed along the near wall, to offset the myriad TVs and fruit machines. To either side of the main bar, raised carpeted areas provide pleasantly intimate hubs of conversation, while to the rear of the pub a gazebo installation and permanent conservatory area allow for extra seating in the sun. A beer garden lies beyond this, and although the management has gone to great lengths decorating the patio with ferns and pot plants, the exit still leads through a rather unseemly loading bay - a minor yet careless oversight. This pub doesn't aspire to be much more than an agreeable City pub, although its outside area is family-friendly until early evening and, unusually, it opens on Saturday lunchtime until 5pm. Large, after work gatherings are most welcome and drinks are efficiently dispatched, while the corner booths allow for small groups and can be hired out in advance. 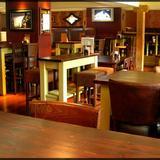 Televised sport is a major draw, and in general the bar is a pleasant meeting point for City goers mid- or post-work. Food at the Rack & Tenter is filling if not spectacular – sharing platters are a safe bet for large groups at £11, while main courses (£8-11) including gammon steak, chilli burgers or beer-battered cod and chips are decent enough, and not too pricey. Sandwiches, wraps and even baked potatoes (£5-6) are on hand for lunchtime customers on a tight schedule, and the few pasta and salad dishes on show (£7-8) offer wholesome alternatives for vegetarians. Perfectly passable pub food for reasonable City prices, especially the £4.95 all-day meal deal on selected light bites. The bar holds no hidden treasures, but neither does it contain any glaring omissions, with Carlsberg, Peroni and Becks among the most popular draught beers (£3.50-4 per pint) and a choice of ales offering a semblance of variety. The wine list is short but to the point, with generous helpings of the house white and red costing around £3.50, while there are enough spirits, shots and mixers to keep the crowds at bay. Uncharismatic but spacious and undeniably welcoming, Rack & Tenter passes muster as a worker-friendly hive of activity in the heart of the City.